As you become one with the sea of maroon robed monks and nuns walking in the foot steps of the thousands before you circumnavigating Asia’s largest Stupa, (Buddhist shrine), you have an overwhelming sense that you are exactly where you are meant to be. With the sound of swirling prayer wheels, the soft chanting of “Aum mani pad me hum” mantra and colorful prayer flags blowing in the breeze over head, you realize they are the only map you need to find your way. 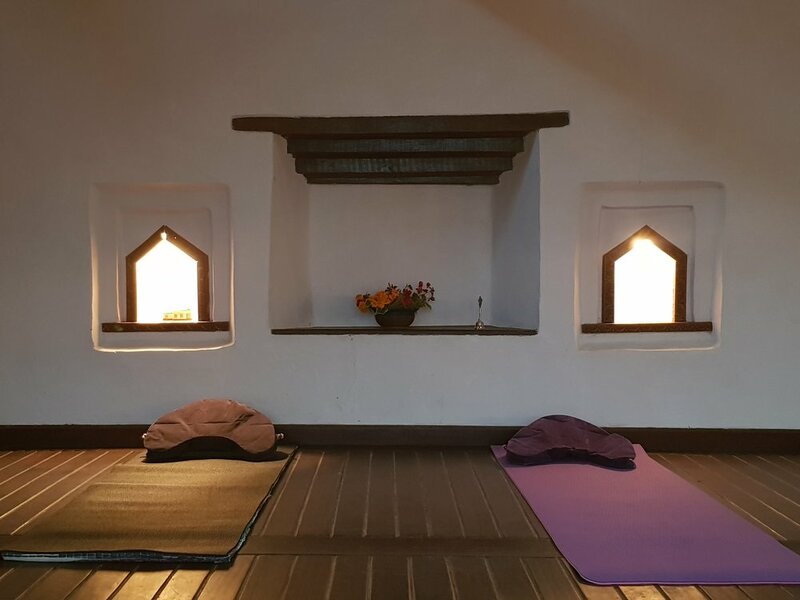 On arriving for your yoga and meditation class you pause for a moment to listen for the sound of monks chanting their morning prayers higher up in the snowcapped mountains. You then step inside and sit down; the outside chatter has gone, and soon your internal chatter quietly fades. You close your eyes and listen to your teacher welcoming you to your practice. As she guides you into deep meditation, you feel blissful. This is where you are meant to be. Here in Nepal you are reconnected with your joy, your passion, and your youness. 14 adventurous days if you..
Have you reached a point in your life when you’re finally free to embrace your alone time? You’re in luck! The Nepal retreat combines adventurous travel, with like minded folk with some time out for self-reflection giving you a sense of liberation. You’ll be immersed by the stunning heights of the Himalayan mountains, which cannot fail to change your perspective. Are you ready to take risks and have new experiences, but need a likeminded soul-seeker by your side as you step into the unknown? On this retreat in Nepal you’ll have a whole “small” group of likeminded soul-seekers around you. You won’t be going it alone. And I dare say you’ll make a life long friend along the way. Are you ready to have your taste buds tantalized and enjoy delicious, nourishing food leaving you feeling satisfied and healthy? That’s exactly what you get on this Nepal yoga retreat! The local food is known worldwide for being tasty, plant-based and wholesome. The Yoga For The Soul Retreats menu is vegetarian and mouth-wateringly delicious. Does recharging yourself and feeling profoundly connected with your heart and the environment around you sound good? Here it is! On this retreat, you'll recharge your batteries daily through deep yoga, meditation, and special "awareness walks" surrounded by towering mountain peaks. And after my guided-meditation journeys into your own soul plus a few nights gazing at the galaxy of stars in the night sky, you'll return home feeling more in touch with life and yourself than you ever imagined possible." Would you like to cultivate self-awareness and feel like you again? It’s waiting for you! In Nepal where I’ve carefully chosen activities and locations that will engage your senses fully into the here and now. 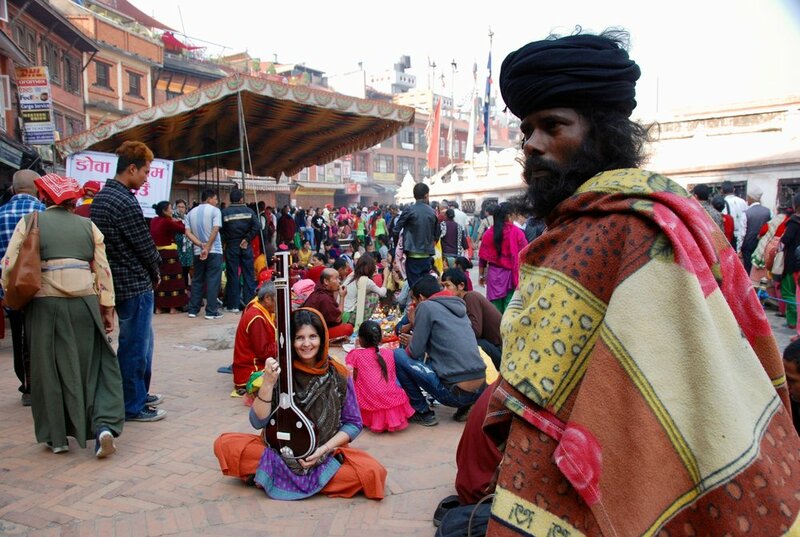 Nepal’s rich culture will immerse you in an array of colours, smells, tastes and human experiences that keep engaging you completely and connecting you back with your authentic self. Do you believe that everyone has a true purpose in life, and that it’s time for you to realise what yours is? You’re in luck! I will guide you through self-enquiry meditation practices at the foothills of the great Himalayas, create space for self reflection in the quietness in the hills of Namobuddha and have organized a chat with a Tibetan Lama, who will inspire you and answer any questions you may have in finding your life purpose. So... WHY should you join me? Yes please, sign me up right now! Nepal first captivates you with its incredible colours. The prayer flags that blow contentedly in the mountain breeze and the spices piled high in the markets. The rich reds, oranges and blues of the architecture and the local dress prove that a more simple life does not have to be dull. Because amidst the joyful colours which celebrate the vibrancy of life, Nepal is rich in spirituality and culture. Look to your right and you’ll see a stunning ancient temple. Look to your left and you’ll see a beautifully cared for shrine, with flower offerings replenished every day. Look down and you’ll see that you’re walking in the footsteps of wonderful people who have a fascinating outlook on life. Look up and you’ll be reminded that all of this is watched over by the awe-inspiring mountains of the Himalayas. Every day there are celebrations honouring some aspect of divinity or nature. The people here embody an understanding of gratitude, and take every opportunity to improve their world by rejoicing in their spiritual souls. 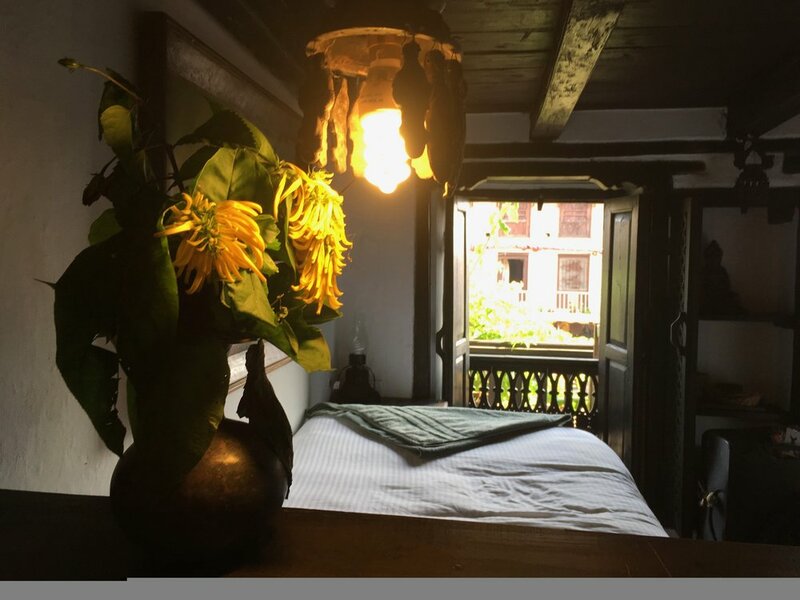 Your accommodation for the first two nights is a true reflection of Nepalese culture; an authentic and peaceful space tucked away from the chaos of Kathmandu. Its colours are as rich as the colours of the streets, but there’s no bustle here. 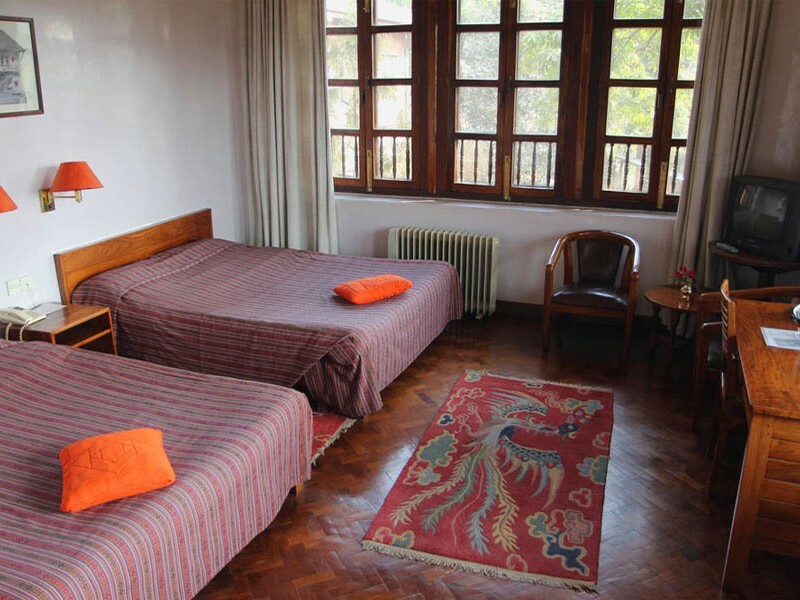 Your Hotel in Boudhanath is spacious, simple and comfortable. You’ll receive a characteristically warm Nepalese welcome and rest contentedly in its relaxed and stress-free atmosphere. Up in the hills you’ll stay in a charming, traditional Nepali style house where you can take in breathtaking views of the valley. In Astam is a simple but comfortable trekking teahouse, where the distractions of your usual life will be replaced by stunning views of mountain ranges which will bring you right into the present moment. 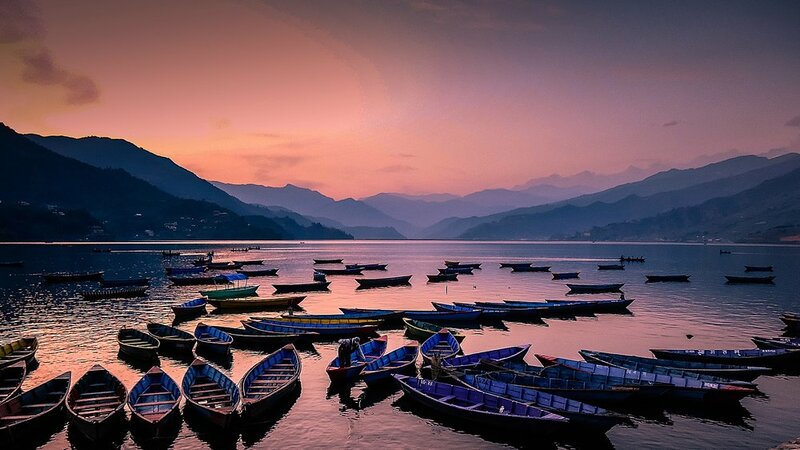 This hotel has all the creature comforts right on shores of Phewa Lake Pokhara. Another peaceful and stunning view to wake up to. And finally, Bandipur's Hotel is the perfect final stop to complete this experience of Nepal: a traditional and authentic inn, embracing the heritage of a historical building and giving you a last taste of the character and charm of Nepalese culture. WHOLESOME, FRESH, TASTY… Simply Delicious! Do you love closing your eyes and relishing the scent of spices and full-bodied flavours cooking in the kitchen — knowing those scents will turn to tastes when you sit down to enjoy a mouth-wateringly delicious meal? Do you love trying new culinary delights in the country that first cooked them up? Do you want to put your meals in the hands of expert local chefs, whose passion for their culture’s cuisine can be tasted in every mouthful? One of last year’s Nepal retreaters described the dishes as divine — and it would be difficult to disagree. You’ll get to experience a mix of Nepal’s most loved traditional dishes, and some meals with a more familiar Western influence. Each restaurant and eatery has been personally selected by me, based on their charm and cultural heritage, ambiance, views from the dinner table, service and cleanliness. And most importantly, DELICIOUSNESS! You’ll devour dal bhat, the national dish of Nepal. 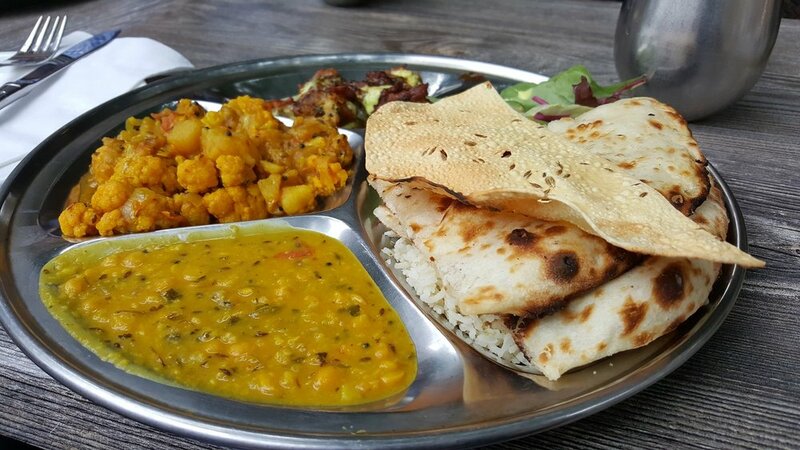 It’s an unbelievable selection of delicately spiced vegetables with lentil soup, rice and roti, all for you — you can take your time to enjoy each taste and nourish your body with wholesome, slow eating. And you’ll munch on momo — traditional Nepalese dumplings. In each bite you’ll taste the fine-tuning of generations in the perfectly steamed fragile-thin dough and the beautifully spiced vegetable or cheese fillings. And if Thai food is your thing, you won’t be disappointed — there will be some tantalising Thai combinations thrown into the mix! There are so many delights planned for this retreat that I’d need to write a book to tell you about all of them — and it’s nice to have a few lovely surprises when you’re dedicating time to working on you, isn’t it?! The journey will take you from the laid back cultural bustle of Kathmandu — experiencing the external world in full colour — to the peaceful stillness of the mountainous valleys where you’ll be gradually guided closer and closer to the subtleties of your internal world. On Day 1, you arrive at Tribhuvan International Airport and your driver takes you straight to Hotel Vajra. Here, snuggled comfortably away from the action of Kathmandu, you can unwind and enjoy your first experience of Nepal’s hospitality. Later, we all gather for the official welcome, brief orientation and a rejuvenating yoga practice to restore you after your long journey. You’re offered an early dinner, before heading off to drift into a deep, peaceful sleep. On Day 2, you awake for a nourishing early breakfast before we head off on foot to the ancient Swayambhunath Stupa (known as the Monkey Temple!). The all-seeing Buddha eyes watch over you from their vantage point at the top of 365 steps — and you know that these eyes see an incredible journey ahead for you. 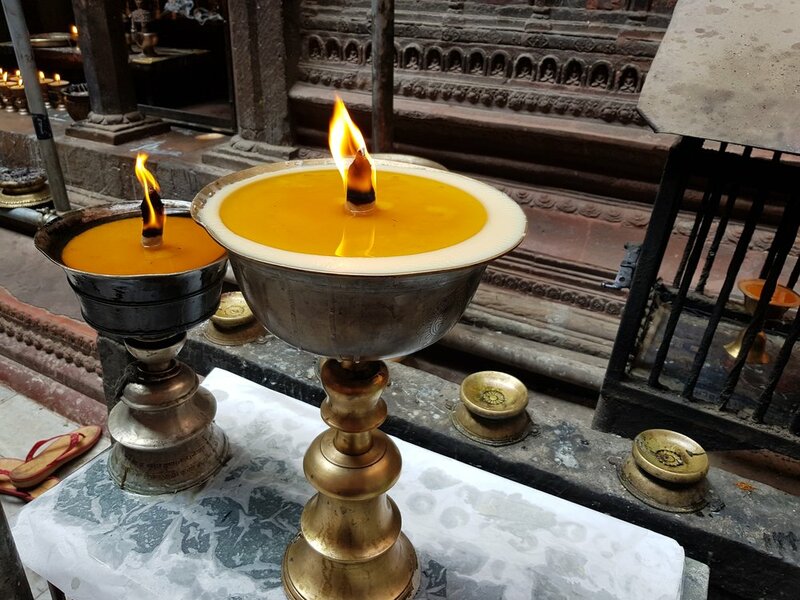 Our guide, Suryadeep, invites us all to join local pilgrims and circumambulate the holy site which he tells the enchanting Buddhist legend of how Swayambhunath came to be. And Suryadeep gives us time to take in the fantastic views over the Kathmandu valley. Back at the hotel, you enjoy a tasty and healthy lunch. Then the afternoon is yours — to relax, to explore, to meditate, to breathe, or to just be. 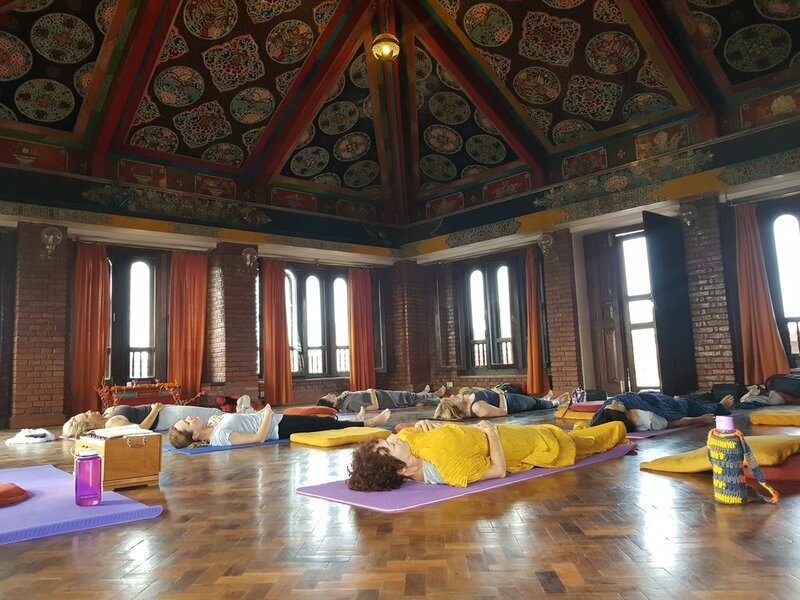 Late afternoon you unwind with a restorative yoga practice, then, we come together again for a sumptuous meal of local Newari cuisine at a century-old heritage building. As Day 3 dawns, you wake up and stretch out your sleep-cosy body with an early morning yoga class. Breakfast replenishes your energy stores so that you’re ready to climb aboard our private vehicle for the journey to Patan Durbar Square. On foot, we explore this UNESCO World Heritage Site – the ornately carved architecture consisting of an enchanting mix of palace buildings, artistic courtyards and graceful pagoda temples. We’re guided by Sham, whose local knowledge brings the place to life. For lunch we go to the Mala Layeku Kitchen — a traditional Nepalese restaurant where you’ll enjoy one of the best Dal Bhat in the world, with a view of the square. And we spend some time with a respected master sound bowl craftsman — you enjoy the stunning sounds on site, or you decide to buy one to take home with you forever. Having had our fill of architectural beauty and local cuisine, we depart for our next destination: Boudhanath. Siddhi Manakamana Hotel becomes our home for the next two nights. Once we’ve checked into the hotel, you choose between staying in for some self-care and relaxation or heading out to explore the labyrinth of Boudhanath. You’ll discover its secrets and its charm — from monasteries to artisanal workshops famous for producing spiritual tools and textiles. On Day 4, your morning yoga class takes place on the rooftop with the sight of prayer flags, the sound of monks chanting, and the scent of incense adding layer upon spiritual layer to your experience. A delicious breakfast carries you on to a dharma talk with a Tibetan Lama. And then you enjoy a scrumptious lunch before setting off to explore Buddhist monasteries and the Boudha Stupa — a great Buddhist shrine which has earned the title of UNESCO World Heritage Site. At dusk Boudhanath Stupa becomes a spiritual rush hour with monks, nuns, and locals gathering for their evening Kora, or circumambulation of the stupa. You decide whether to join them or to settle yourself in one of the many rooftop restaurants to take in the sight from afar while you enjoy dinner at your leisure. Day 5 finds you full of excitement for more incredible experiences and self-discovery. You share breakfast with your fellow spiritual travellers before heading to Pashupatinath — one of the holiest Hindu temples in Nepal, situated on the banks of the sacred Bagmati River. The atmosphere is electric as the early morning worshippers arrive to perform their daily Pujas (ceremonies). Holy men emerge and open air cremation pyres are alight with the rituals of sending loved ones from this life to the next. You take it all in. At the valley’s edge, we find the Namo Buddha Resort. We check in and settle for three nights of simplicity and inspiration, looking out at the landscape of the Himalayas. After a hearty and delectable lunch, picked straight from the organic garden, you immerse yourself in the surroundings, go for a walk, indulge in a sauna or sit back and enjoy the view. And then before bed, we come together for a peaceful early evening yoga/meditation class followed by a delicious dinner. On Day 6, we visit the Thrangu Tashi Yangtse Monastery. Here we sit as hundreds of monks chant ancient scriptures. Tibetan horns sound. Bells ring. Incense burns. The power of the earth and human experience ignites your soul. On Day 7, we walk together. After yoga and breakfast, we embark on a 3 hour trek through beautiful villages and terraced fields with unexpected delights always presenting themselves. On returning to Namobuddha you relish in another delicious lunch before having the afternoon free to explore, rest or meditate as you wish. Later, we realign our energies by practising yoga and meditation together before dinner. And then there is time for you look up at the stars and share quiet words in confidence with the friends you’ve made amongst the group — who you begin to realise may well be friends for life. As you move your body gently through your yoga practice on the morning of Day 8, you feel a sense of openness and ease that tells you all is well. You’re ready to fly — so we make our way to Kathmandu Airport to catch our flight to Pokhara. From there, we travel by road to Astam. As the road glides by outside, you feel yourself moving inwards. Your internal world is becoming clearer. We settle in at the Mystique Highland Resort, and then you are free. You go for a walk or explore a local tea plantation. Or you relax with the incredible vistas ahead of you. Yoga today helps you to connect even more deeply with yourself. You find that your practice is building, every day. Your knowledge is growing. You feel steady. On Day 9, your body is ready to trek again — and your heart is open to anything that comes your way. 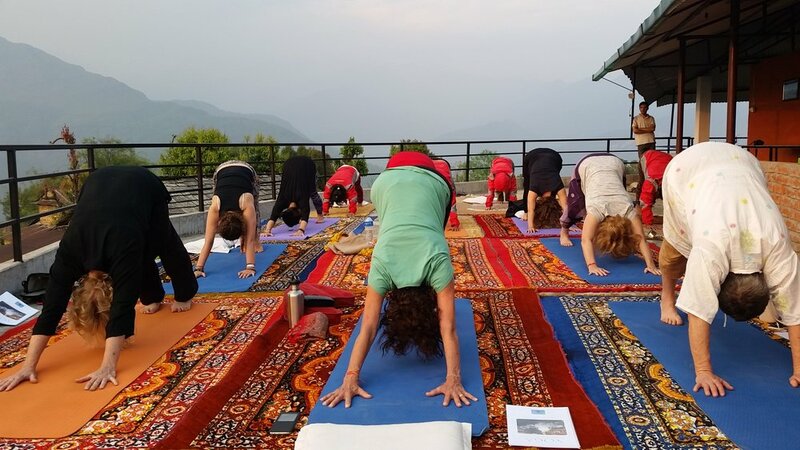 Yoga today takes place outside, with the Annapurna mountain ranges towering overhead. Day 10 is just for you. With no plans and no schedule, you are free to explore or relax in whatever way feels right for you. Oh, you do have to schedule in your well deserved 90 minute spa treatment though! On Day 11, a short morning walk along the shore of Lake Phewa brings us to where we will practice yoga this morning. As the lake reflects the mountains there’s an incredible moment when you look across the water and see, in the sparkling light, a reflection of the bright strength and deep peace you’ve gained over the trip so far. You walk on with anticipation of what still is to come. After breakfast, we set off by road to Bandipur. At the beautifully renovated Old Inn Bandipur we eat, rest, and then restore with afternoon meditation. This day of movement and reflection closes with a delicious dinner on the balcony. The mountain skyline turns pink and orange before the stars light up Nepal. 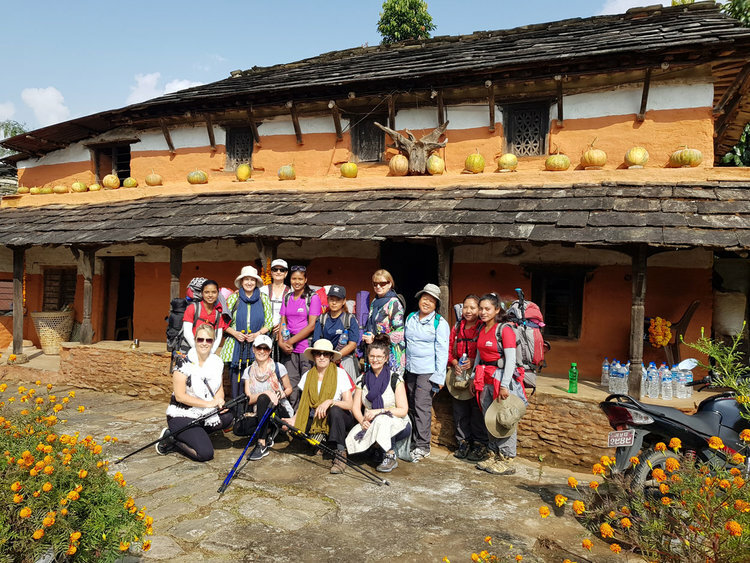 Following breakfast on Day 12, we walk out into the countryside of Bandipur. You may choose to explore alone, or with a few people from the group. You can walk through the local village, or put on your hiking boots for a 4-6 hour trek to the village of Ramkot and back. When you arrive back at Old Inn Bandipur, dinner is at your leisure. Day 13 begins with breakfast, before we leave Bandipur and drive to Pokhara to catch a flight right back to where this journey began: Kathmandu, and Hotel Vajra. In the afternoon we savour the final yoga class of the retreat together. It’s a beautiful practice, and you feel a deep sense of belonging. Together, we celebrate the journey we’ve been on over a last, mouth-watering dinner. On Day 14 you rise late after a long, well-deserved sleep. You take your time over breakfast before you depart for the airport, or for wherever you’re going next. I can't wait ~ sign me up! This trip will put an end to your late-night worries and give you the tools to fill in the gaps in your life. It will take you out of your comfort zone as you leave your familiar life at home and immerse yourself in an incredibly vibrant culture. Be prepared to feel different. But it’ll be good different. You’ll realise that you already know who you are — you just needed the space and support to let your true self shine. • Be surrounded and supported by a small group of likeminded new friends as well as an experienced teacher and guides. • Experience the profound mind and heart-opening effects of daily yoga and meditation practice. • Release control during deep relaxation and Yoga Nidra, so that your body and soul can truly relax. • Learn how chanting mantras can bring more joy into your life — and you may even sit amongst monks chanting in monasteries giving you an authentic and powerful experience. • Connect with yourself through mindful breathing techniques and meditative work, so that you can realise your true potential. Surprises, and other delightful extras! breakfast and lunch on day 1, and four meals throughout the trip (but don’t worry, Nepal has amazing food at incredible prices! For most Nepal means a long haul flight so I suggest you arrive a day or two early (18 or 19 Octember 2019) so you can rest up before you embark on an adventure of a lifetime, starting 3pm on 20 October 2019. Georgina Grandi who is a Personal Travel Manager at Travel Managers can take care of all your travel arrangements, offering competitive pricing on airfares and travel arrangements to Kathmandu and beyond. Email Georgina at georgina.grandi@travelmanagers.com.au, call on (+61) 0410 741 240. A 10% Discount on Travel Insurance - is offered to all Yoga for the Soul Retreats participants when purchasing through Georgina Grandi. Chetana I must join you in Nepal! Sign me up! However, something was still missing, that elusive thing called “happiness”. Oh, and a third car accident I’d just been involved in, yes three under my belt, this really got me thinking, WHY? I began to study metaphysics and spiritual healing, and it was only when I discovered yoga and meditation that I found an inner peace and contentment that I had never quite experienced in life. Before I knew it I had immersed myself in a life of yogic philosophy and lifestyle for the better part of ten years, living within an ashram environment in Australia, India, and a Buddhist centre in Nepal. Now, all these years later, I’m living my dream -- drawing on all my experiences and sharing these wisdom teachings and spectacular countries with others. And creating retreats like no other! I love to travel and run culturally rich yoga and meditation retreats! For me, rubbing shoulders with the locals, immersing myself in diverse and spiritually rich cultures, and sharing all that with others is my passion. It all started back in my 20s when I bought a one-way ticket to Eastern Europe and beyond. I travelled through Africa, the Middle East and Asia, often well off the beaten track. Oh, what stories I have to share! Five years later I returned to Australia where I found myself seeking more from life. I began to work and study in Outdoor Leadership and Guiding where I enjoyed leading people on outdoor adventures throughout Australia. "I have been fortunate to have travelled to many countries, over many years. I have hiked, biked, trekked, toured, back-packed and 5-starred the length and breadth of most continents. Because of her passion for Nepal, her knowledge of yoga practice and her love of travel herself, Chetana was able to open doors to both spiritual and geographical worlds that one only sees in books. Her sensitivity to understand individual needs, her respect and reverence to local culture and people led us in a beautiful journey both inwardly and outwardly. An experience that will stay with me a lifetime. Thank you Chetana!" I'm so ready for this book me in now!! Payment needs to be finalised by 30 July. Full payment within 3 months of departure is required at the time of booking – entire payment is non-refundable. Late bookings will be accepted after 30 July if places are available. Late registrations are required to make full payment at the time of booking – entire payment is non-refundable. Any cancellation made up to 30 July 2019 will result in a loss of the non-refundable deposit of US$600. Any cancellation made between 31 July and 20 October or no shows will result in a total loss of funds. We reserve the right to cancel the trip if it is not meeting the trip minimum (if we do your money will be refunded in full). If you wish to cancel your reservation, it must be done in writing or via email and the cancellation will be effective as of the date Yoga for the Soul Retreats receives it. Trip cancellation insurance is always recommended whenever making travel plans. oh, have i not booked yet ~ pronto lets do it now! !